Dr. James Naismith invented the game in 1891 in Springfield, Massachusetts at Springfield College. He was a Presbyterian minister (but never preached)… and a doctor (but never practiced medicine)… and an educator and physical education teacher… and a basketball coach. 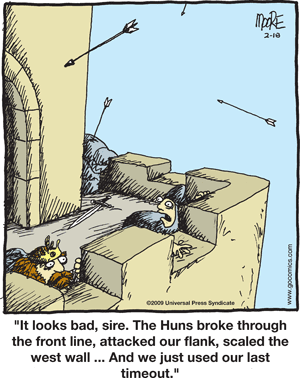 He was born in Almonte, Ontario of Scottish ancestry … so this great American (and now worldwide) sport was invented by a Canadian, with a Scottish accent! He was a thirty year-old assistant physical education director when he invented the game. He only played in two games! The first baskets were not peach baskets as the story often goes, but were vegetable baskets nailed to the railing of an elevated circular running track, which just happened to be about 9 or 10 feet high. He eventually became head of the physical education department at Kansas, and designed the first golf course in Kansas. His favorite sport was fencing and he was very good at it. He invented basketball for fun, as a simple physical education activity… not something to be serious about! He said often, "Basketball is just a game to play. It doesn’t need a coach… you don’t coach basketball, you just play it." Nevertheless, he became basketball coach at Kansas in 1900, and lost his first game 48-8 to Nebraska. He coached for eight years and his won-loss record was barely .500. But he started a great Kansas tradition. For years, the Kansas Jayhawks had one of the most winning programs in all of college basketball. Phog Allen (Kansas, record: 590-219), Adolph Rupp (Kentucky), and Dean Smith (North Carolina) were all Jayhawks. Naismith never patented his game, and did not profit from it. Lawyers advised him to get a patent, but he was always adamantly opposed to it. At one point his personal finances were so bad that his house in Kansas was repossessed by the bank. Dr. Naismith worked with the famous football coach, Amos Alonzo Stagg. He helped Stagg design the first football helmet. Stagg later gave credit to basketball for the development of the forward pass in football. The first public game was in Armory Hill YMCA on March 11, 1892, with a crowd of 200 on hand, as the students beat the teachers 5-1. Amos Alonzo Stagg scored the only point for the teachers. The first women’s game was March 22, 1893 at Smith College in Northampton, Massachusetts. The first college game was Feb. 9, 1895… Minnesota State School of Agriculture beat Hamline 9-3. The first women’s college game was in April 1895 between Stanford and California. The first men’s professional league began in 1898 and was known as the National Basketball Association (but not the same NBA as today). The first national AAU basketball tournament was in 1897. Wisconsin claims to be the first state with a high school state tournament, which was won by Fond du Lac in 1905. High school basketball attracted national attention 12 years later in 1917. Basketball was first played in the Olympic Games in 1936, in Berlin, when the USA beat Canada 19-8 for the gold medal. The game was played outdoors, in the mud and rain, on a tennis court. Some of the early rules: The ball. The original ball was a soccer ball. 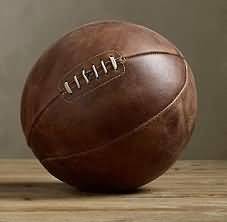 The official sized ball came in 1894, was an inflated rubber ball, and sometimes was lopsided. So when you hear the game referred to as "roundball", remember that it wasn’t always so. The basket. Peach and vegetable baskets were used, but it was a nuisance to get out the stepladder every time someone scored! In 1893, a carpenter designed a wire rim, with a chicken wire net. It didn’t exactly SWISH! Backboards were designed so that fans, reaching over the railing, couldn’t deflect the shots. Some believe the origin of the term "cagers" relates back to the old chicken wire nets. But probably it was because early courts were surrounded by a "cage" of wire netting to keep the ball out of the stands. Prior to the "cage", the out-of-bounds rule was basically a free for all... whoever got there first got the ball, so players went diving into the stands and scuffles between players and fans occurred. Number of players. Originally, 9 players were on each team… then 7, and now 5. Dr. Naismith once said that there could up to 40 on each team, if the floor was big enough! Fouls. On your second foul, you had to sit down on the bench, with no substitution (sort of like hockey), until the other team scored a goal, and then you could come back in. On a flagrant foul, you were disqualified for the rest of the game, with no substitution… so your team might be playing with only 8 instead of 9 players. If your team committed three consecutive fouls, the other team was awarded a goal. Out-of-bounds. The 5-second rule was original. If the ref couldn’t tell who hit it out last, the ref would just throw the ball straight out into the court, and whoever got it, got it! Game times. Two 15-minute halves, running watch. Halftime was 5 minutes. The winner is: The team with the most goals… 1 point per goal. If there was a tie, the captains on each team could agree to play until another goal was scored (so it was sudden death or victory). Positions. Dr. Naismith suggested the 9 players be arranged on the floor as: a goalkeeper, 2 guards, 3 centers, 2 wings and a "home man" (basket hanger)… no 3-second rule in those days. Roughness. Dr. Naismith did not want it to be rough like rugby… "The time to stop roughness is before it begins". He found that after a team committed two consecutive fouls, they would really be careful not to foul again, since the third foul would give the other team a goal… and not many goals were scored in those days. The jump shot and the fast break had not yet been invented! Dribbling and ball handling was not as good, with a lopsided ball. The center jump. After each basket was made, a center-jump was held at mid-court… the other team didn’t automatically get possession. Dr. Naismith was very opposed to the rule change later that eliminated the center jump. He felt that eliminating the center jump penalized the team that just scored. The other team could now take the ball and stall with it for a long time, if they had the lead. The 10-second rule eventually came in to force teams to advance the ball up the court and speed up the game. Many teams held the ball for very long periods of time, and the scores were very low. The game has come a long way. To quote Bob Broeg, "The roundball, not the snowball, is the symbol of winter now, and winter has never been the same since 1891!" 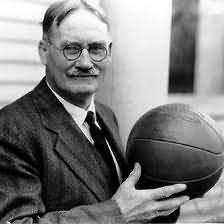 "Basketball: a new game", James Naismith, Springfield College, Coaching Basketball by Jerry Krause, Masters Press, 1994. "The Basketball Man", Bob Broeg, Coaching Basketball by Jerry Krause, Masters Press, 1994. "Basketball History", Jerry Healey, Coaching Basketball by Jerry Krause, Masters Press, 1994. - book by Charles "Chic" Hess. Professor Ernest Blood was a generation ahead of his time. His coaching record of 1268-165 does not fully explain his excellence as a coach. His major flaw was winning too much. His biography explains why he is the most extraordinary of all Basketball Hall of Fame members.